Mini or Micro-B USB jack for power and/or USB uploading, you can put it in a box or tape it up and use any USB cable for when you want to reprogram. Let me take you on a tour of your Trinket! 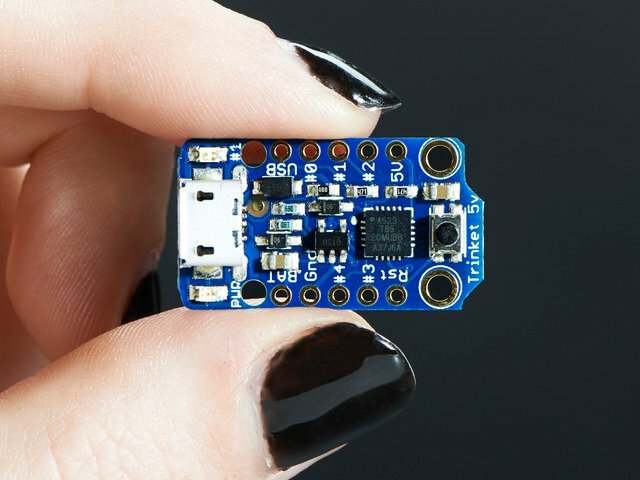 Each trinket is assembled here at Adafruit and comes chock-full of good design to make it a joy to use. Red #1 LED - this LED does double duty. Its connected with a series resistor to the digital #1 GPIO pin. It pulses nicely when the Trinket is in bootloader mode, and its also handy for when you want an indicator LED. 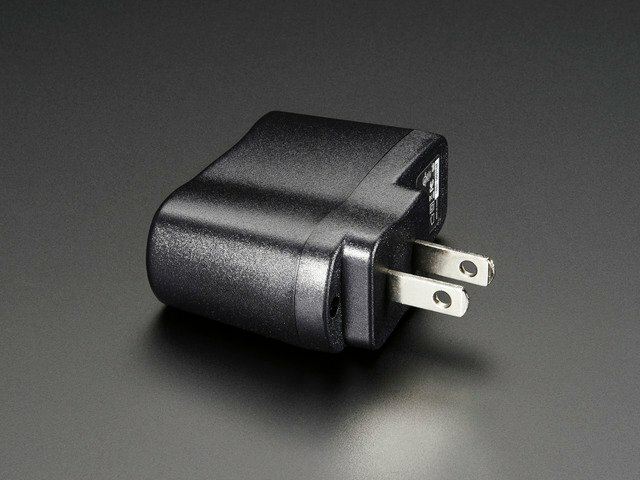 USB Power Output - You can also snag the 5V power from the USB jack in case you need 500mA+ current from your computer or portable USB power pack. 3 or 5V output - an onboard regulator provides 3.3V or 5V output for powering LEDs, sensors, small motors, etc. Reset Button - an onboard reset button will launch the bootloader when pressed and the Trinket is plugged into a computer. If it is not connected to a computer, it's smart enough to go straight to the program. External Reset Pin - we bring out the reset pin so you can reset or restart your Trinket on the road. If the Trinket is in a box or otherwise hard to get to, you can wire up a button to this pin for an external reset button. Four mounting holes make it easy to attach with 2mm screws or even tiny zip-ties, string, etc. BAT+ is the Battery + Input pin. If you want to power the trinket from a battery or power adapter or solar panel or any other kind of power source, connect the + (positive) pin here! You can connect up to 16V DC. If you have a 3V Trinket, you'll want at least 3.5V input to get a good 3.3V output. If you have a 5V trinket, 5.5V or higher is suggested. This input is reverse-polarity protected. On a 3V Trinket, the GPIO are 3.3V output level, and should not be used with 5V inputs. On a 5V Trinket, the GPIO are 5V output level, and can be used with 3V inputs but may damage electronic devices that are 3V input only! GPIO #0 - this is connected to PB0 on the ATtiny85. This pin can be used as a PWM output, and is also used for I2C data, and SPI data input. GPIO #1 - this is connected to PB1 on the ATtiny85. This pin can be used as a PWM output, and is also used for SPI data output. This pin is also connected to the onboard LED (like pin 13 on a regular Arduino). GPIO #2 - this is connected to PB2 on the ATtiny85. This pin can be used as an analog input (known as Analog A1), and is also used for I2C clock and SPI clock. The next 2 pins are also used for USB programming. That means that when the Trinket is connected to a computer and in bootloader mode or in the middle of uploading a new program, they are used for sending data to/from the computer! It's possible to share these pins if you are careful. The best use of these pins is as outputs to things like LEDs. We didn't want to keep these pins off the board but we strongly recommend not using them unless you're sure you need them since you might have to disconnect any connections to reprogram the Trinket! This pin has a 1.5K pullup to 3.3V built into the Trinket, for USB comm so it may be difficult to use for analog or digital input. Note the numbering of analog pins: Pin 2 is Analog 1, Pin 3 is Analog 3, Pin 4 is Analog 2. For the Uno, the terms A1, A2, and A3 are mapped for you. For ATtiny85's, they are not. So for the pinMode calls, use the Pin number (stenciled on Trinket), for analogRead, use the analog number. The final two pins are at the bottom of the board. First is the Rst reset pin. This is connected directly to the ATtiny85's reset pin and also the reset button which is right next to it. The reset pin is used to enter the bootloader and to reset the board in case you want to restart it. It's also possible to use this pin to re-program in the bootloader or completely remove the bootloader if you have an AVR programmer such as an AVR Dragon, MKii or USBtinyISP. If you want to re-program the board when its in an enclosure or box or otherwise hard to reach, wire a simple button from the RST pin to ground and press it to enter the bootloader for 10 seconds. The #1 LED will pulse to let you know. The reset button cannot be used as a GPIO, but we think its a lot more useful as a proper reset button! One of the challenges with the Trinket is that we wanted to have a built-in USB bootloader, but the ATtiny85 doesn't have built-in USB hardware! There are existing USB bootloaders that can work on the 't85 but they use other companies' USB VID/PIDs. Since it not permitted by the USB developer's group to use others' VID/PIDs we had to adapt one of these existing bootloaders to use our USB ID, but we also wanted to not have to re-compile avrdude or the Arduino IDE since that's such a pain. If you're using Windows be sure to follow the Windows Driver Installation page to install the appropriate drivers for your Trinket. For Mac OSX or Linux you don't need to install any drivers. 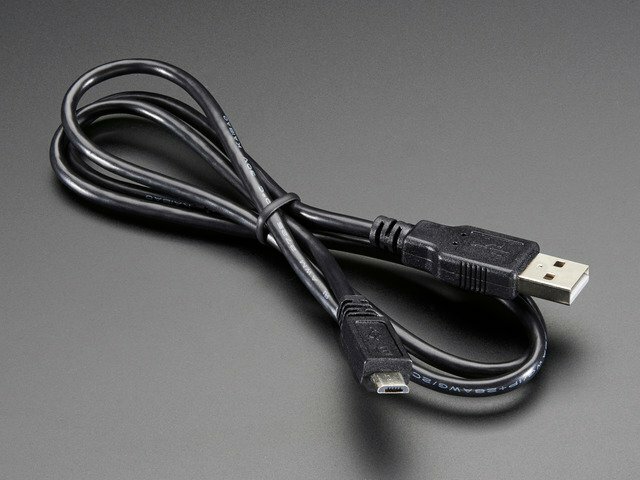 The Trinket must be connected to a computer via a USB cable to enter bootloader mode. You can enter the bootloader mode by pressing the little button on the board with your fingernail. The bootloader will 'time out' after 10 seconds, so to re-enter the bootloader mode just re-press the button! Chances are, you picked up a Trinket because it is programmable with the Arduino IDE. Note that the Trinket is not a full Arduino-compatible, it uses a different (smaller) chip than the Uno, Mega, Leonardo or Due. However, there are many small sketches and libraries that will work just fine. Some may not even need anything other than pin number changes. Just follow the steps in the steps in the Adafruit Arduino IDE setup guide to easily add support for Trinket, Gemma, Pro Trinket & more to the Arduino IDE. When you're finished installing the IDE & board manager add on come back to this page to continue the Trinket guide. When you're ready to upload, make sure the "Programmer" in the Tools menu is set to USBtinyISP! The Serial Port menu will not show the Trinket, that's normal! Plug in the Trinket, make sure you see the green LED lit (power good) and the red LED pulsing. Press the button if the red LED is not pulsing, to get into bootloader mode. That means the bootloader wasn't active. Make sure to press the button on the Trinket to activate the bootloader before clicking the Upload button. Try again! 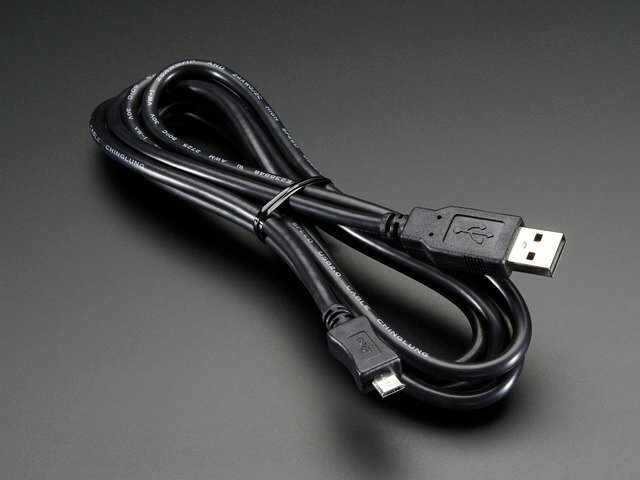 Make sure you have a good USB cable, try connecting through a hub if you have one. On Linux if you get the error message "usbtiny_receive: error sending control message: Protocol error (expected 4, got -71)"
These can generally be ignored and should not interfere with the program upload. Unfortunately Linux's USB core is a little flakey communicating with the ATtiny85 processor on the Trinket/Gemma and can cause these errors. If an upload does fail, try it again as it is likely an intermittent issue. Once you've gotten the basic Blink example to work, you can try some of the other Arduino functions and libraries. We'll be filling out this section with more example code and links to tutorials - this is just to get you started! This is a bit confusing because the analog pins are numbered differently than the digital pins! There are a few PWM outputs on the Trinket, you can call analogWrite() on digital #0, #1 and #4. Make sure you're using the latest Trinket IDE so you can access pin #4's PWM capabilities. If you aren't using the latest IDE you need to manually add functions like the following to init and write analog values to pin #4. However if you have the latest IDE it includes fixes to make pin #4 usable with Arduino's analogWrite function! On the Trinket boards, pin #0 is SDA (I2C data), pin #2 is SCK (I2C clock). Adafruit NeoPixel - control up to ~100 Neopixels via a Trinket! SoftwareSerial - the built in SoftSerial library can (at least) transmit data on any digital pin. More as we do more testing and verification! For more technical users, rather than using the Arduino IDE, they may want to program the Trinket directly with AVR-GCC as the compiler, vi/emacs as their editor and AVRdude as the uploader. That's easy to do! Target the Attiny85 as the chip used in avr-gcc, with F_CPU at 8MHz using the internal oscillator. Look for the line System wide configuration file is ..... thats where avrdude.conf is. Because the USB bootloader is a little different than an off-the-shelf programmer, we have to update the configuration file to have a longer erase delay. This does not affect programming bare Attiny85 chips, so you can use this configuration file with Trinkets or raw chips without any problems. If you want to update your avrdude.conf by hand, its not too hard. Then paste in the following in the spot where you just deleted! If editing manually, Mac users should delete all references to parallel port programmers ("type = par;"). the bootloader is not active, make sure you see the red LED pulsing, press the reset button to start the bootloader again. When uploading, you will see a lot of avrdude: 8 retries during SPI command and similar warnings. THIS IS OK! Because of the way the ATtiny85 works, there's a small delay when writing the new program to flash, and during that delay, it cannot save the data and also send USB data at the same time. This causes the USB reply to avrdude to be delayed and avrdude to spit out the retry alert. You can use an Arduino UNO to re-program the bootloader onto your Trinket (or Gemma). This loader isn't tested to work with any other kind of Arduino. On a Gemma, alligator clips work well. the Reset pin is underneath the MiniUSB Jack. You may have to solder a wire temporarily. Alternatively, sometimes you can just hold the reset button down while running the sketch (type 'G' to start) and it might work. Soldering a wire works best. Then download, uncompress and run the Trinketloader sketch, pick the one that matches your Arduino version! Uncompress and open in the Arduino IDE, select the UNO and serial port to the UNO Arduino board you are uploading too and upload it to the UNO. If you keep getting "Failed to verify fuses" while trying to restore the bootloader on a 3.3V Trinket using a Duemilanove. Try connecting 5V to the 3V pin on the Trinket, not VBAT+. Make sure USB is not plugged into the Trinket when you do this. Its a bit of a hack but may help! How come I can't find the Trinket Serial (COM) Port? Why is no Serial port found when the Trinket is plugged in? Trinket (and Pro Trinket) do not have a USB-serial converter chip on board, this is how we can make them so small! Instead of a serial console, the Trinket is programmed directly over USB. No COM/Serial port is used at all! My Trinket 16MHz can't control servos, NeoPixels, but the code is uploading OK? Sounds like the Trinket thinks its running at 8MHz but the Arduino software thinks it's running at 16MHz, this causes timing-specific stuff like Servos and NeoPixels to not work. Don't forget you must turn on 16MHz speedup if you are uploading to "Trinket 16MHz"
That is, a shorter delay. Can Trinket driver Neopixels (strips, squares, etc)? How many? Yes! Trinket was designed to drive short segments of NeoPixels. There is enough RAM on the attiny85 to drive 100 pixels, but depending on program RAM usage you may have to scale back to 60 or 40. You can use EITHER the 3V or 5V Trinket, at EITHER 8 or 16MHz! Connect the + power line of the strip to VBUS (5V from USB), to VBAT if you are powering the Trinket with 4-7VDC, or to a separate 4-7VDC power source such as a 3 or 4 pack of AA batteries. 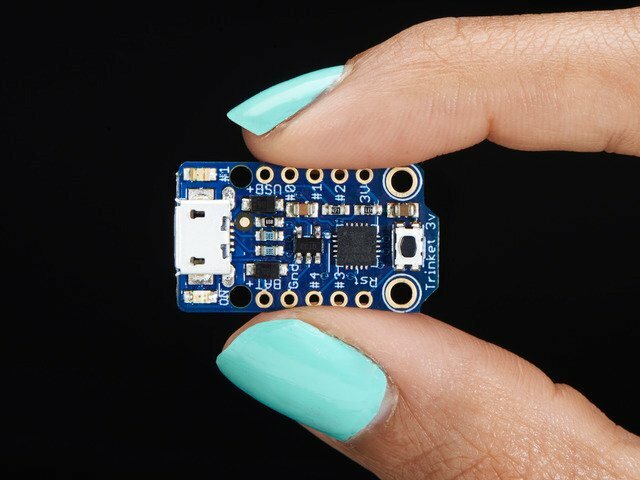 Can the Trinket drive your Adafruit I2C LED Backpacks for 7-segment/matrix displays? Short answer: yes! Check out http://learn.adafruit.com/tap-tempo-trinket for a tutorial on driving the 7-segment displays. Long answer: we think there's not enough space for all of the fonts for the 8x8 so you might be able to drive the 8x8 matrix in 'raw' mode (see the HT16K33 example sketch in the LEDBackpack Library) but unfortunately not with built-in font support. Can Trinket drive a Servo? Why does Windows sound the Connect/Disconnect chimes every ten seconds? The Trinket only appears to be a USBtinyISP device when the bootloader is running. By design, the bootloader only runs for 10 seconds and then jumps back to the main user sketch. this causes the 'disconnect' sound. On a new trinket, the main sketch will automatically jump back to the bootloader, which will then cause the 'connect' sound. This cycle will repeat until a user sketch is loaded. This situation can also happen if you load a sketch with a bug in it that causes a CPU reset. Can I power the directly on the 5.0V or 3.3V (e.g. treating those as a power input)? This guide was first published on Sep 03, 2013. It was last updated on Sep 03, 2013.